ORIGINAL OMA® BRAND. OMA® is a registered brand with the US Patent and Trademark Office. Our logo, brand, and slogan are all intellectual property of World Bazaar Imports. World Bazaar Imports is the ONLY authorized DISTRIBUTOR AND SELLER of this brand in North America. 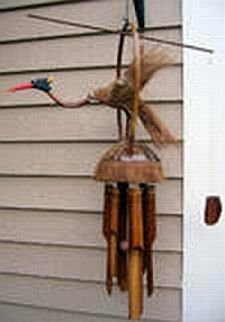 Let the gentle sound of these windchimes transport you to the exotic island of Bali where these chimes were handcrafted. A bright beaked bird bobs its head on a coconut shell perch when swayed by the gentle wind. A unique piece that will add interest to any decor.